Companies in the Print Industry are DOING NOTHING Online. Why? This is the question everyone should be asking. We have been asking this question of many printers in the industry and the most common answers we get back always fall into two categories. Not to sound too harsh, but this is just wrong! We work with a ton of companies in the Print Industry and it works for ALL of them. It really comes down to doing the marketing activities online that will actually produce results for you. Yes, this sounds a little vague but below are a few details that ensure it works. I can tell you it’s much more expensive to NOT market online. 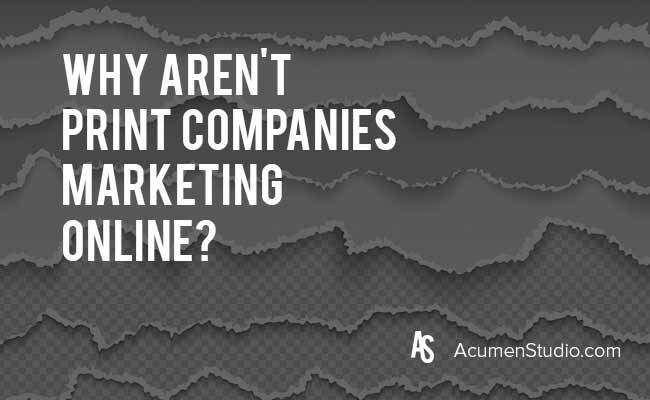 The problem really is with our Industry (Digital Marketing / Content Marketing). There are too many marketers and agencies that say they are the “Guru” of this or the “Expert” in that, but the truth is they just know how to market themselves. You MUST know the industry you are marketing for (Print in this case) and be good at the tactics of what you recommend (SEO, PPC, Social, Email and Analytics). How well do you know SEO? Can you show me an example, tell me how you did it and the results you got? How well do you know PPC? How well do you know Google Analytics? How have you used Analytics to solve a marketing problem? If you do these things then your online content marketing will work AND will cost less AND will get you More Leads & More Sales. You can read more about Digital Marketing & Content Marketing for Print Companies by Clicking Here. Let’s get right to it on this one! 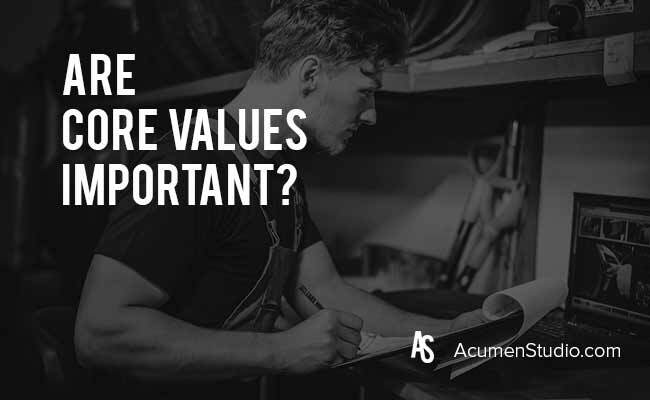 We’ve all heard of core values and how they help to shape a company. But why are they important and what are they really meant to do? Core values are meant to help align an organization as a whole and to help everyone achieve its mission. When values are not established or unknown to the employees of the organization or company, it’s easy to start working towards different goals, have different intentions and thus produce different outcomes. Core values should help an organization to hire, fire and set the tone for the company culture. Have you ever heard of the phrase, “your vibe attracts your tribe”? This phrase speaks to having solid core values and making them known not only to your employees but to your customers, and to the public. The more you practice your core values the more like-minded individuals you will attract whether that be the next rockstar employee or the next loyal client/customer. Check out some of the most common core values among US companies below. What are some of the core values of your company? What are your personal core values? At this point you should already realize that social media isn’t just a place where friends and family connect, share photos and like posts. Social has become a repository of knowledge, similar to the search engines, but more affinity driven by relationships and trusted sources. If you want to know who to use for internet law, who can help you with an ESOP or what company is building quality apps, then social is a great place to get real feedback and reviews from people who have ACTUALLY used those services or know their work. Understanding how your target customers are using social media is key to gaining visibility, providing education to and engaging with these targets. Has Anyone Heard of this Company? A go to question asked by many business owners, executives, directors, buyers, managers, etc. If an executive reaches out to their network asking for personal feedback on a company and one of their peers responds with good things to say, then you are on your way to landing new business. While not every business will get a personal recommendation, if you have been marketing yourself well, then someone will at least know of you and respond with something like “I’ve seen this company and they look like they know what they are doing.”. This is the next best thing, because you have built a small amount of social capital and trust with this target. This stage of discovery is very important and completes the infinite loop of growth through marketing, which you can see clearly in our content marketing funnel (which is more of an hourglass), where past customers become salesmen for your business. Once a customer has been made aware of your business, whether it was from a referral on social media or they got nothing on social and asked the wise search engine Google, they will absolutely look your company up on social media. Again this is a critical B2B Social Media step. While the majority of B2B product & services companies are served well on LinkedIn, it is important to understand that these same customer targets have social profiles on many platforms and will look to find you where they are at in the moment (this could be Facebook, Twitter, Instagram, YouTube, Pinterest in addition to LinkedIn). Plus, you will have a more diverse result in the search engines with a cross-platform social media presence. More results, Knowledgegraph inclusions, image results, Twitter feed, etc. These customers will look to see if you are a legitimate business and size you up to see if you are a good fit. Questions like “Are they too big?”, “Are they too small?”, “Do they think like I think?”, and many more. This is where being clear on your own brand and business is important, because it will qualify buyers for you in a very efficient way, driving better leads into your sales funnel. At this point two main things will happen. A customer will contact you via phone, form submission or email (they will find this info on your social profiles, if you have built them out completely). Or the customer will educate themselves more on a specific product or service. How Will Your Product or Service Help Me? This is what most businesses think of as soon as they hear B2B Social Media or Social Media Strategy. And rightfully so, because it is so critical. Social Media is a great place to get this clarifying, compelling and enlightening content in front of prospective buyers. These customers are comparing you to your competitors and the more you can educate them, the better chance you have of winning that business. While you will want this content to primarily live on your website, social is the channel you will distribute this educational material to ensure it gets seen and gets the buyer back to your site where you can convert them or reach back out and communicate in other ways. Depending on your product or service the mix of B2B content types will differ and the tactical strategy for each channel can be tailored as well. As with any marketing you should conduct research to identify key information to that will guide the marketing efforts. B2B Social Media is no different. Our recommendation is to take the research beyond social as well by using Google search query data (the keywords) and pair it with social media research on your target customers social platforms, including the less thought about forums and groups such as Quora and LinkedIn groups. Creating an inventory of who your target prospects is very important and taking this even further by identifying the stakeholders in those companies and engaging with their personal accounts on social will drive massive results. 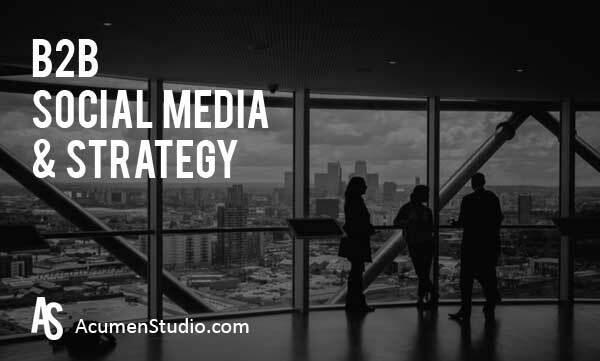 This leads us to a few specific tactics that we recommend for a superior B2B Social Media Strategy. Following and engaging with the business accounts of your prospective customers, the individual accounts of the decision makers of those businesses and the same for your current customers will create much-needed visibility, awareness, affinity and trust with the organizations that you want to do business with. This exposes you to the businesses you want to work with and gets your customers talking about you more, while at the same time you are indirectly getting in front of other potential customers who also engage with the same companies you are targeting. This works like a charm and very few businesses are doing this! To be 100% Honest, this isn’t easy for most businesses. Tracking, monitoring, analyzing, measuring and reporting to identify an ROI on your B2B marketing and social media efforts takes using platforms that can help you measure impact, attribution, and sales. Most businesses are not equipped to do this (as are most marketers!). You will either need to educate yourself on using platform specific social media analytics, social media tools such as Hootsuite, Buffer, SproutSocial, etc. or hire an agency to help you with this. What we can tell you is that social media for B2B companies Pays Off BIG! Or, You can give us a call now at 866-357-7422 to talk. 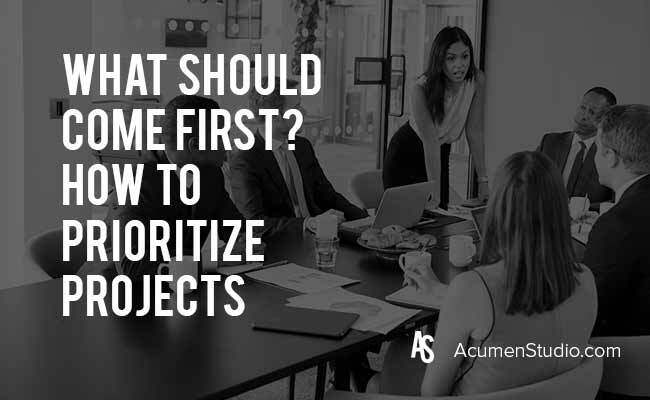 Deciding what project gets done first can be tough at times right? Sometimes you just don’t know exactly how to pick what will take priority over the other since they are at the same level. In the case of this, there is a strategy that I employ to make sure that I am making the right choice, even though it may push another project back by a week. Pushing a project back by a week is not always the worst, especially if you’re like me and set an internal deadline a week or two prior to when the client wants it to be completed. It is kind of like a pro’s and con’s list. As the account manager you have to break down each project to determine the amount of work that will have to go into it, the level of expectation each client has, and the deadline that the client may or may have not stated to you at the start. Every agency has a standard for projects. Here are some important factors to take into account. You have to break down each project and understand what it all includes. Level of work the project includes. Is it all hands on deck or maybe one or two? Does this require the assistance of a designer? Because designing can take time. Will this project overload one or more team-member? While everyone on your team was aware of the projects at hand, they may have been working on the parts that they knew they were going to have to take ownership. Send out a memo to the team about what is getting moved around and what the expected timeline is for each project. Schedule a meeting to discuss it and get everyone’s opinion on it, especially if this project may overload one individual but not the rest. When shifting projects it is not just about the client, but about your team and their ability to efficiently and correctly get the project done without cutting corners. Projects sometimes come in waves, and sometimes one at a time. Knowing your team and what they can handle makes project management manageable. I’m going to keep this blog post pretty short so that I can stress how simple and easy this is for you to get found in the search engines more often by your customers. Google My Business which is the hub for companies to integrate and control their presence within the Googlesphere, Google KnowledgeGraph, Search Engines, Local Search, etc. (whatever you want to call it). If you’ve ever searched for a service, product or company and Google Maps listings came up and/or information on the right hand side of your search results then you’ve seen the results of a Google My Business Listing. Creating this, Optimizing it and Verifying the listing will get your more visibility and more business. Without going into a ton of detail here there are just a few steps to getting your company found more often in the search engines, more phone calls, website visits, leads and revenue using the Google My Business tool. The internet looks to a few providers of data as the authority and Google is one of them. So ensuring your information is accurate with the King of the Internet if extremely important. People, Other Listing Services, etc. will use this data to connect with you which will get your more business and visibility. The other Massive benefit is the the majority of print industry related search terms are localized. 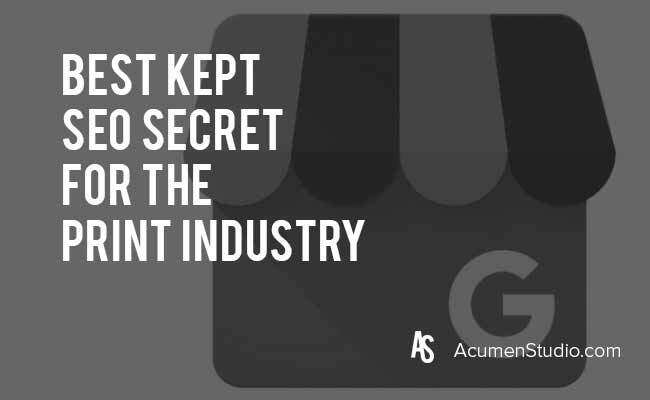 This means that nearly every product or service search term you want to be found for is going to show local results including Google Maps listings. More visibility, More Leads, More Sales! In closing we actually do this creation, optimization and verification for companies in the print industry, so if you decide to not try and do this yourself then reach out because we are REALLY GOOD at it and can make sure you get a High ROI from your listing.